The 2013-2014 season of the Dominica Football Association began with a couple interesting events which could have far reaching consequences. The season began with two double headers at the Windsor Sports Stadium on August 17 and 18 amidst a five-day (August 14-18) football coaches' course conducted by South American based Englishman, Gary Stempel. The experience of FIFA Instructor Stempel was outlined by DFA public relations officer Gerard George. Stempel worked for 10 years with Millwall Football Club in south east London as youth community development officer of the first and second divisions. At the national level he coached Panama's Under20 team to qualify in their first ever Youth World Cup in the United Arab Emirates in 2003. He coached the Panama national team in 2009 to the Nations Cup and Gold Cup with Panama going on to beat Costa Rica for the Nations' Cup for Panama's first ever international championship. Stempel went on to coach Guatemala's Under-17 and Olympic teams. Stempel also coached at the club level in El Salvador; and conducted FIFA coaching courses in Belize, United States Virgin Islands, Costa Rica, Nicaragua and Grenada. Stempel guaranteed the 22 coaches lots of fun, practical and theory of football. He urged the coaches to come forward with their particular problems so that they could find solutions for a more interesting and far more enthusiasm for the players. DFA president Glen Etienne noted that an important component of football is coaching, if football is to make any meaningful stride. "Those who have been given the responsibility to impart knowledge must be adequately equipped", he said. Etienne also pointed out that the fact of the commencement of the football season and the coaches' course was no coincidence. "It was deliberate as it would give the coaches fresh ideas and pump them up for the season," he stated. 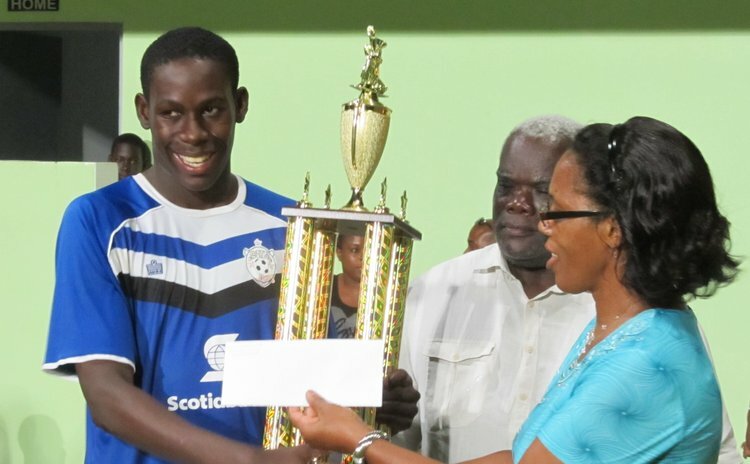 Were the newly promoted Division I Champions, Exodus of St Joseph pumped up when they played their first match with Lime Premier League champions, Scotiabank Bath Estate, to claim a famous two goals to one victory in their maiden premiership match? Exodus Football Club beat Bath Estate 2-1 (1-1). Tariq Morvan gave the newcomers the lead from the penalty spot in the fifth minute with Delbert Graham drawing the scores level about half an hour later. Lara Jno Baptiste became the hero when he found the important winner in the second half. Naeille Lee of Bath Estate got the red card from referee Carlisle Jno Baptiste. Earlier that Sunday, Glensworth Elizee scored the only goal which gave Northern Concrete & Steel Bombers a 1-nil victory over Sagicor South East in a clash of former champions. Former champions Dublanc FC hammered Ai-cons 6-2 (2-1) in the opening match of the new campaign on the Saturday. Scoring for Dublanc were Briel Thomas (2), Shikel St Marie, Teddy Riviere, Horace Mills and Jamie Deluge; and for Ai-cons, the scorers were Kareem Prosper and Kimani Phillip. 2012 champions, KFC Harlem United, beat Sam Martin Pointe Michel 4-2. On target for Harlem were Kelly 'The Crab' Peters (2), Nigel Sanderson and Sham Addi John; and for Pointe Michel, brothers Randolph and Sylvester Peltier were the scorers. Referee Nehron Williams showed Pointe Michel's Jolsen Lendor the red card.